Patricie currently works as a Transport Technical Advisor to Rwanda’s Minister of Infrastructure. In Rwanda, she’s already a recognized leader in her field. Her proposed design for a parking system in Kigali's central business district has been adopted as a basis for future development. In May 2015, she graduated from UC Berkeley’s Engineering School where she earned a Masters in Civil Engineering, with a focus on Transportation Engineering, and gave the commencement speech for the Graduate School of Engineering. While studying at UC Berkeley, Patricie also completed an internship at the San Francisco County Transportation Authority. 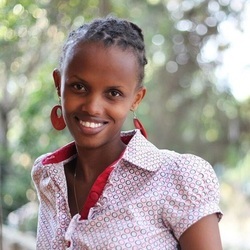 She received a full-ride scholarship to UC Berkeley from the MasterCard Foundation, and she is an alumna of Generation Rwanda and Moremi Initiative. In Rwanda, she earned a B.S. degree in Civil Engineering at the Kigali Institute for Science Technology, and during the summer of 2015, Patricie returned to Rwanda to organize a women’s leadership summer camp, made possible by a $10,000 grant she won from the Davis Foundation. She’s passionate about transportation infrastructure development and is eager to contribute to building and planning sustainable transport infrastructures.